The latest wall stencil ideas make it possible to decorate with texture using only wall paints and cutting edge stencils. Wall painting stencils may seem out dated or low brow for some people but there wall stencil ideas that will amaze. We've all seen those decorating books from the '70's. But if you're looking for stunning home decorating ideas on a budget - and you want Glam with a capital "G" then don't overlook the latest cutting edge stencils. 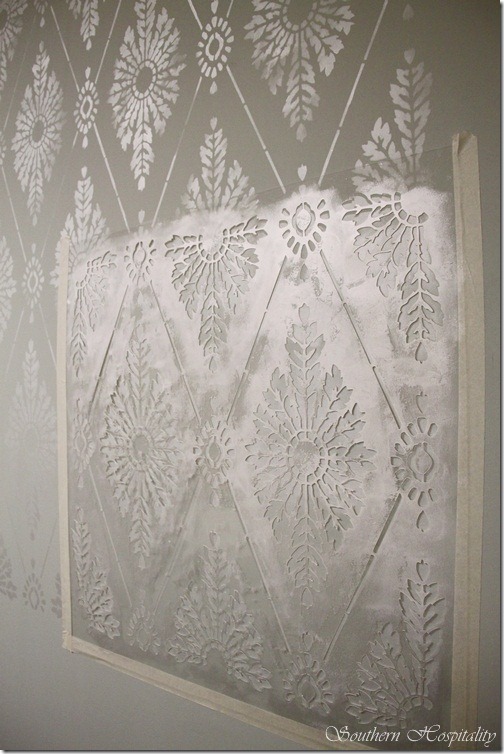 Using wall stencils will give your rooms a look you never thought possible without hiring some fancy pants decorator. Suddenly your rooms look styled. 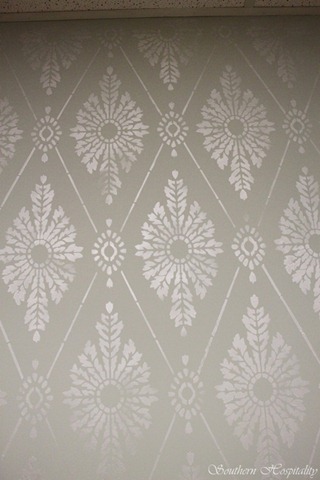 Cheaper than most wallpapers, stencils are just the thing if you are home decorating on a budget. But be selective. You will get a superior finish if you use cutting edge stencils. The effects you can create with wall painting stencils can range from velvety to vintage wallpapers and they look amazing when done correctly. Today's stencils are cutting edge stencils. They trick the eye so it appears you are decorating with texture. So for the uninitiated - wall painting stencils uses a decorative technique which creates a motif by dabbing paint over a design that has been cut out of a sheet of paper, plastic or metal. Wall stencils have been around for quite some time - but they are definitely getting better. Instead of just creating a wall border, they now give the effect of decorating with texture and look more 3 dimensional. 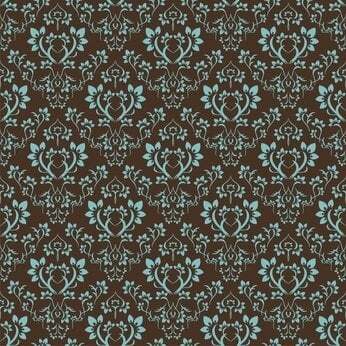 The designs can be repeated over an entire space as shown in the photo above or they can be used as in a classic Greek, Roman or Vintage Victorian borders. And the beauty is you don't need to do a whole room. Wall stencils allow you to do only the sections you want to get a great Rockstar effect . Great news if you want home decorating ideas on a budget. Southern Hospitality have created an effect that any 5 star hotel would love! Here's a look at their article. I gave you a sneak peek a few weeks ago of my sister’s basement craft room that we are working on. She has this great space down there and after they got floating engineered hardwood floors installed, as part of the “great flood” of 2011, she was excited to do something with the space. She decided on a craft room. Never mind, that she is not that crafty. She does enjoy parties and having a place to store wrapping paper and supplies. Besides a pretty craft room is a huge perk! It’s really hard to show a stencil project and do it justice, but I’ll try to describe this one. This stencil is by Cutting Edge stencils, one of my sponsors. They make very fine stencils too and I enjoyed this one. I love the feathery feel of it, along with the diamonds. The one difference in this stencil and the one we used in my sister’s bedroom is the first one had registration marks and this one does not. I do prefer registration marks. This one overlaps, meaning, you add the paint where needed after taping up on the wall, then remove the stencil, move down the wall or over to the right or left and overlap part of the stencil that has already been painted. So, it just takes a bit longer to line everything up this way. There are more points that have to be lined up before you begin painting again. 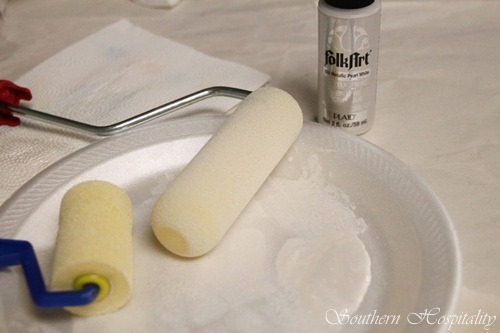 We used a pretty Folkart pearlized paint in Ivory and small foam rollers. Because there was more stencil to cover with this pattern, it took us a little longer on this one. Probably around 4 hours total, still not that bad. We started in the middle top of the wall and moved to the side, then back down below the first one. The paint dries fast, so you don’t have to worry too much about the overlap part, but to be safe, we alternated back and forth, left to right, and down. It actually goes pretty fast once you get started. I will probably do more investigating into the latest wall stencil ideas. Stenciling is brilliant. It creates an effect that looks like you are decorating with texture and fabric - but it's an illusion and I love that! And perfect if you need home decorating ideas on a budget. Read 7 Best Home Tips and Tricks for Small Spaces which talks about how to scale things for small homes or rooms. I love wall stencils! 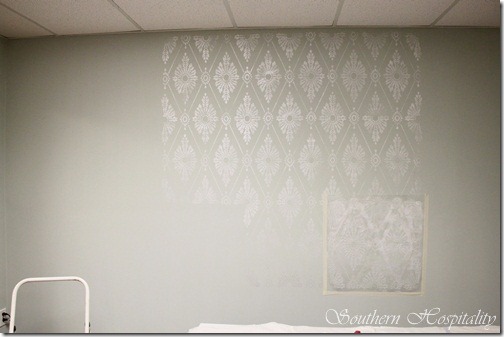 Wall stencils are great for decorating with texture only using paint. Which is perfect if you need home decorating ideas on a budget. 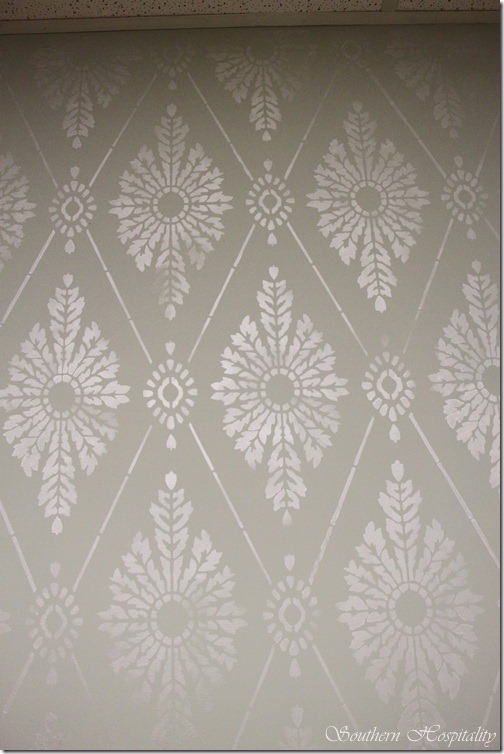 If you've found some great wall painting stencils or have some wall stencil ideas - leave a comment. If you have any tips on how to do it simply, I'd love to hear from you. Like this article? Please Like us on FB and go ahead and share - but only with friends!